Ghost Boy transcends the genre by its intensity of emotion and the quality of the writing. Ghost Boy takes you inside the consciousness of a young man trapped inside an unmoveable body, unable to communicate, yet feeling and understanding everything. We have an extraordinary opportunity to experience, through Martin’s story, what it is like to be here and yet not here. Now Martin has emerged from his darkness we can celebrate this amazing, deeply moving story of recovery and the power of the imagination. Written with Megan Lloyd Davies. [Pistorius’s] levels of empathy are remarkable, perhaps because he was forced for so many years into the role of watcher and listener, hearing people unburden their problems around him, absorbing their pain without them knowing... [his] communication is strikingly direct, almost fearless in the way he confronts emotional reality. Martin tells the story of his remarkable recovery—and how he eventually came to find love, a home and a job… Now in a deeply moving – and ultimately uplifting - new book, Martin Pistorius tells the amazing story of life as The Ghost Boy. 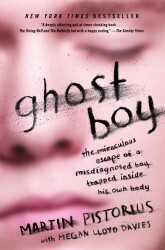 An absolutely incredible read, the most inspiring aspect of Ghost Boy is the endless resolve and humility of the author himself: recognising that he is solely reliant on others if he is to ever escape the confines of his broken body, Pistorius doesn’t become resentful but instead takes advantage of every act of kindness bestowed upon him, making the most of every opportunity to communicate with those around him. Ghost Boy will stay with you long after you turn the final page – but perhaps not in the way that you would expect. Yes it’s emotional. It’s sad. And parts of it are downright harrowing. But it’s also … surprisingly funny.